We strive to add value to operation and maintenance procedure of Facility Management Services, Captive Power Plant (CPP) as well as HVAC plants. We offers ONE STOP SOLUTION for all the requirements of customer’s facilities by providing the most competitive, reliable and environment friendly solutions. >> Complete Facility Management Services of corporate establishment & shopping malls. >> O & M of Diesel based captive power plant. >> O & M of HVAC (Heat Ventilation & Air Conditioning) plant. >> Erection & commissioning of Elevators and Escalators. >> O & M of Coal based thermal captive power plant. BULMAN provides Facility Management Services for your establishments thereby taking care of all mechanical & electrical requirements as well as soft services. BULMAN provides service solutions for power plant & Air conditioning plants in terms of Operation & Maintenance and overhauling of equipments. The range covers all makes of gas and oil fired engines, turbine generators & thermal power plants for CPP sectors and air conditioning plants for HVAC sector . Bulman has team of qualified trained erectors to undertake erection & commissioning of elevators & escalators as well as maintaining the same. Bulman provides the ultimate solution for your engineer Services. 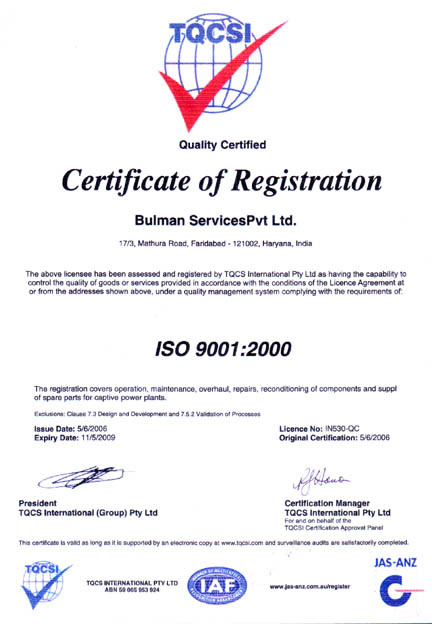 Bulman’s facility services and operations business is built upon the global base of such services which also includes apart from malls and corporate establishments, Power plants and HVAC plants. The group supports its customers throughout the lifecycle of these products. � 2014 All Rights Reserved, Bulman Services Pvt. Ltd.